Russian Foreign Minister Sergei Lavrov announced Monday that the next round of Syria peace talks in Kazakhstan's capital Astana will be held on July 10. "The latest meeting of participants will take place in Astana on July 10," Lavrov said at a news conference in Beijing, quoted on the foreign ministry website. 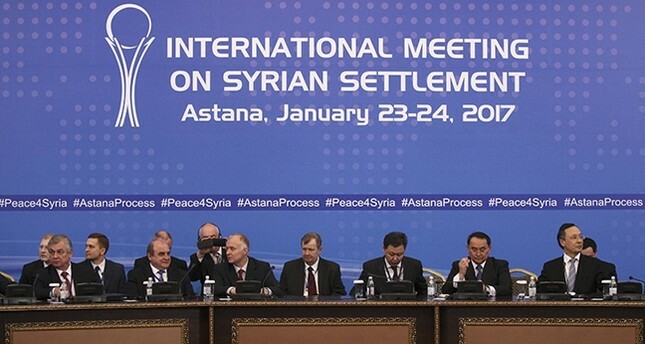 The negotiations were launched by Turkey, Russia and Iran in January when representatives of the Assad regime and opposition groups were brought together in the capital of Kazakhstan. The meeting is set to coincide with a fresh round of U.N.-sponsored Syria peace talks that will also begin in Geneva the same day. Lavrov said U.N. Syria envoy Staffan de Mistura, who announced the date for the Geneva round on Saturday, will take part in the Astana talks. It was not immediately clear whether the talks in Geneva and Astana would be held simultaneously or at different times. "The subject is currently being discussed," a spokesman for De Mistura said in Geneva. Lavrov also made a call to fully respect sovereignty and territorial integrity of Syria after an American Navy fighter jet shot down early Monday a Syrian regime SU-22 fighter jet shortly after it attacked U.S. partner forces. "Any actions on the ground, and there are many participants, including those who carry out military operations, must be coordinated with Damascus," Lavrov said. Russian foreign minister urged the U.S. and all others who have their forces or their advisers on the ground in Syria to ensure coordination, adding that de-escalation zones were one of the "possible" joint options. "I invite everyone to avoid unilateral actions, respect the sovereignty of Syria and get involved in our common work, which is agreed with the Syrian Arab Republic's government," he added. Lavrov said Russia, Turkey and Iran promoted the Astana process to find a solution to the Syrian conflict. A new round of Astana talks had been scheduled for June but was then indefinitely postponed as key players wrangled over the future of fragile safe zones agreed for Syria in May. On May 4, Russia, Turkey and Iran signed a deal in the Kazakh capital Astana to establish de-escalation zones in Syria. The May 4 de-escalation zone agreement envisages the halt of hostilities between Assad regime forces and moderate opposition groups within the zones as well as the creation of conditions for humanitarian access, medical assistance, the return of displaced civilians to their homes and the restoration of damaged infrastructure. The guarantor states previously agreed to take all measures necessary to continue fighting Daesh, al-Nusra and other terrorist groups both within and beyond the de-escalation zones. Lavrov said Monday that the de-escalation zones "are one of the possible options to move forward together".